For other uses, see Macdonald (disambiguation). "McD" redirects here. For other uses, see MCD (disambiguation). "McDo" redirects here. For the Philippine fast-food chain that is known locally as this name, see McDonald's Philippines. For technical reasons, "McDonald's #1 Store Museum" redirects here. For the museum, see McDonald's No. 1 Store Museum. McDonald's is an American fast food company, founded in 1940 as a restaurant operated by Richard and Maurice McDonald, in San Bernardino, California, United States. They rechristened their business as a hamburger stand, and later turned the company into a franchise, with the Golden Arches logo being introduced in 1953 at a location in Phoenix, Arizona. In 1955, Ray Kroc, a businessman, joined the company as a franchise agent and proceeded to purchase the chain from the McDonald brothers. McDonald's had its original headquarters in Oak Brook, Illinois, but moved its global headquarters to Chicago in early 2018. McDonald's is the world's largest restaurant chain by revenue, serving over 69 million customers daily in over 100 countries across 37,855 outlets as of 2018. Although McDonald's is best known for its hamburgers, cheeseburgers and french fries, they also feature chicken products, breakfast items, soft drinks, milkshakes, wraps, and desserts. In response to changing consumer tastes and a negative backlash because of the unhealthiness of their food, the company has added to its menu salads, fish, smoothies, and fruit. The McDonald's Corporation revenues come from the rent, royalties, and fees paid by the franchisees, as well as sales in company-operated restaurants. According to two reports published in 2018, McDonald's is the world's fourth-largest private employer with 1.7 million employees (behind Walmart with 2.3 million employees). The siblings Richard and Maurice McDonald opened in 1940 the first McDonald's at 1398 North E Street at West 14th Street in San Bernardino, California (at 34°07′32″N 117°17′41″W﻿ / ﻿34.1255°N 117.2946°W﻿ / 34.1255; -117.2946) but it was not the McDonald's recognizable today; Ray Kroc made changes to the brothers' business to modernize it. The brothers introduced the "Speedee Service System" in 1948, putting into expanded use the principles of the modern fast-food restaurant that their predecessor White Castle had put into practice more than two decades earlier. The original mascot of McDonald's was a chef hat on top of a hamburger who was referred to as "Speedee". In 1962, the Golden Arches replaced Speedee as the universal mascot. The symbol, Ronald McDonald, was introduced in 1965. The clown, Ronald McDonald, appeared in advertising to target their audience of children. 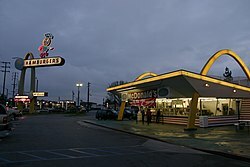 On May 4, 1961, McDonald's first filed for a U.S. trademark on the name "McDonald's" with the description "Drive-In Restaurant Services", which continues to be renewed. By September 13, McDonald's, under the guidance of Ray Kroc, filed for a trademark on a new logo—an overlapping, double-arched "M" symbol. But before the double arches, McDonald's used a single arch for the architecture of their buildings. Although the "Golden Arches" logo appeared in various forms, the present version was not used until November 18, 1968, when the company was favored a U.S. trademark. The present corporation credits its founding to franchised businessman Ray Kroc in on April 15, 1955. This was in fact the ninth opened McDonald's restaurant overall, although this location was destroyed and rebuilt in 1984. 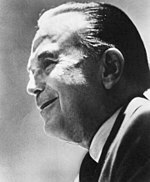 Kroc later purchased the McDonald brothers' equity in the company and begun the company's worldwide reach. Kroc was recorded as being an aggressive business partner, driving the McDonald brothers out of the industry. Kroc and the McDonald brothers fought for control of the business, as documented in Kroc's autobiography. The San Bernardino restaurant was eventually torn down (1971, according to Juan Pollo) and the site was sold to the Juan Pollo chain in 1976. This area now serves as headquarters for the Juan Pollo chain, and a McDonald's and Route 66 museum. With the expansion of McDonald's into many international markets, the company has become a symbol of globalization and the spread of the American way of life. Its prominence has also made it a frequent topic of public debates about obesity, corporate ethics, and consumer responsibility. By 1993, McDonald's had sold more than 100 billion hamburgers. The once widespread restaurant signs that boasted the number of sales, such as this one in Harlem, were left at "99 billion" because there was space for only two digits. McDonald's restaurants are found in 120 countries and territories around the world and serve 68 million customers each day. McDonald's operates 37,855 restaurants worldwide, employing more than 210,000 people as of the end of 2018. There are currently a total of 2,770 company-owned locations and 35,085 franchised locations, which includes 21,685 locations franchised to conventional franchisees, 7,225 locations licensed to developmental licensees, and 6,175 locations licensed to foreign affiliates. Focusing on its core brand, McDonald's began divesting itself of other chains it had acquired during the 1990s. The company owned a majority stake in Chipotle Mexican Grill until October 2006, when McDonald's fully divested from Chipotle through a stock exchange. Until December 2003, it also owned Donatos Pizza, and it owned a small share of Aroma Cafe from 1999 to 2001. On August 27, 2007, McDonald's sold Boston Market to Sun Capital Partners. Notably, McDonald's has increased shareholder dividends for 25 consecutive years, making it one of the S&P 500 Dividend Aristocrats. The company is ranked 131st on the Fortune 500 of the largest United States corporations by revenue. In October 2012, its monthly sales fell for the first time in nine years. In 2014, its quarterly sales fell for the first time in seventeen years, when its sales dropped for the entirety of 1997. In the United States, it is reported that drive-throughs account for 70 percent of sales. McDonald's closed down 184 restaurants in the United States in 2015, which was 59 more than what they planned to open. This move was also the first time McDonald's had a net decrease in the number of locations in the United States since 1970. For the fiscal year 2017, McDonalds reported earnings of US$5.2 billion, with an annual revenue of US$22.8 billion, an decrease of 7.3% over the previous fiscal cycle. McDonald's shares traded at over $145 per share, and its market capitalization was valued at over US$134.5 billion in September 2018. The company currently owns all the land, which is valued at an estimated $16 to $18 billion, on which its restaurants are situated. The company earns a significant portion of its revenue from rental payments from franchisees. These rent payments rose 26 percent between 2010 and 2015, accounting for one-fifth of the company's total revenue at the end of the period. In recent times, there have been calls to spin off the company's US holdings into a potential real estate investment trust, but the company announced at its investor conference on November 10, 2015, that this would not happen. The CEO, Steve Easterbrook discussed that pursuing the REIT option would pose too large a risk to the company's business model. The McDonald's logo painted on the tail of a Crossair McDonnell Douglas MD-83 in 1999. The United Kingdom and Ireland business model is different from the U.S, in that fewer than 30 percent of restaurants are franchised, with the majority under the ownership of the company. McDonald's trains its franchisees and management at Hamburger University located at its Chicago headquarters. In other countries, McDonald's restaurants are operated by joint ventures of McDonald's Corporation and other, local entities or governments. According to Fast Food Nation by Eric Schlosser (2001), nearly one in eight workers in the U.S. have at some time been employed by McDonald's. Employees are encouraged by McDonald's Corp. to maintain their health by singing along to their favorite songs in order to relieve stress, attending church services in order to have a lower blood pressure, and taking two vacations annually in order to reduce risk for myocardial infarction. Fast Food Nation also states that McDonald's is the largest private operator of playgrounds in the U.S., as well as the single largest purchaser of beef, pork, potatoes, and apples. The selection of meats McDonald's uses varies to some extent based on the culture of the host country. On June 13, 2016, McDonald's confirmed plans to move its global headquarters to Chicago's West Loop neighborhood in the Near West Side. The 608,000-square-foot structure was built on the former site of Harpo Productions (where the Oprah Winfrey Show and several other Harpo productions taped) and opened on June 4, 2018. The McDonald's former headquarters complex, McDonald's Plaza, is located in Oak Brook, Illinois. It sits on the site of the former headquarters and stabling area of Paul Butler, the founder of Oak Brook. McDonald's moved into the Oak Brook facility from an office within the Chicago Loop in 1971. Richard H. Lenny, non-executive of Conagra Brands, Inc.
On March 1, 2015, after being chief brand officer of McDonald's and its former head in the UK and northern Europe, Steve Easterbrook became CEO, succeeding Don Thompson, who stepped down on January 28, 2015. McDonald's has become emblematic of globalization, sometimes referred to as the "McDonaldization" of society. The Economist newspaper uses the "Big Mac Index": the comparison of a Big Mac's cost in various world currencies can be used to informally judge these currencies' purchasing power parity. Switzerland has the most expensive Big Mac in the world as of July 2015, while the country with the least expensive Big Mac is India (albeit for a Maharaja Mac—the next cheapest Big Mac is Hong Kong). Thomas Friedman once said that no country with a McDonald's had gone to war with another. However, the "Golden Arches Theory of Conflict Prevention" is not strictly true. Exceptions are the 1989 United States invasion of Panama, NATO's bombing of Serbia in 1999, the 2006 Lebanon War, and the 2008 South Ossetia war. McDonald's suspended operations in its corporate-owned stores in Crimea after Russia annexed the region in 2014. On August 20, 2014, as tensions between the United States and Russia strained over events in Ukraine, and the resultant U.S. sanctions, the Russian government temporarily shut down four McDonald's outlets in Moscow, citing sanitary concerns. The company has operated in Russia since 1990 and at August 2014 had 438 stores across the country. On August 23, 2014, Russian Deputy Prime Minister Arkady Dvorkovich ruled out any government move to ban McDonald's and dismissed the notion that the temporary closures had anything to do with the sanctions. Some observers have suggested that the company should be given credit for increasing the standard of service in markets that it enters. A group of anthropologists in a study entitled Golden Arches East looked at the impact McDonald's had on East Asia and Hong Kong, in particular. When it opened in Hong Kong in 1975, McDonald's was the first restaurant to consistently offer clean restrooms, driving customers to demand the same of other restaurants and institutions. McDonald's has taken to partnering up with Sinopec, the second largest oil company in the People's Republic of China, as it takes advantage of the country's growing use of personal vehicles by opening numerous drive-thru restaurants. McDonald's has opened a McDonald's restaurant and McCafé on the underground premises of the French fine arts museum, The Louvre. On January 9, 2017, 80% of the franchise rights in the mainland China and in Hong Kong were sold for US$2.080 billion to a consortium of CITIC Limited (for 32%) and private equity funds managed by CITIC Capital (for 20%) and Carlyle (for 20%), which CITIC Limited and CITIC Capital would also formed a joint venture to own the stake. On April 1, 2019 Nations Restaurant News reported that McDonald’s made a rare choice, spending $3.7 million to invest in Plexure (a New Zealand app developer). Which makes this investment a first for McDonald’s. A typical "eat-in" McDonald's meal as sold in Hong Kong, consisting of French fries, a soft drink, and a "main product" – in this case, a McSpicy Chicken Fillet. Condiments are supplied in small packets; such a packet of tomato ketchup is seen in the foreground. McDonald's predominantly sells hamburgers, various types of chicken, chicken sandwiches, French fries, soft drinks, breakfast items, and desserts. In most markets, McDonald's offers salads and vegetarian items, wraps and other localized fare. On a seasonal basis, McDonald's offers the McRib sandwich. Some speculate the seasonality of the McRib adds to its appeal. Products are offered as either "dine-in" (where the customer opts to eat in the restaurant) or "take-out" (where the customer opts to take the food off the premises). "Dine-in" meals are provided on a plastic tray with a paper insert on the floor of the tray. "Take-out" meals are usually delivered with the contents enclosed in a distinctive McDonald's-branded brown paper bag. In both cases, the individual items are wrapped or boxed as appropriate. Since Steve Easterbrook became CEO of the company, McDonald's has streamlined the menu which in the United States contained nearly 200 items. The company has also looked to introduce healthier options, and removed high-fructose corn syrup from hamburger buns. The company has also removed artificial preservatives from Chicken McNuggets, replacing chicken skin, safflower oil and citric acid found in Chicken McNuggets with pea starch, rice starch and powdered lemon juice. In September 2018, McDonald's USA announced that they no longer use artificial preservatives, flavors and colors entirely from seven classic burgers sold in the U.S., including the hamburger, cheeseburger, double cheeseburger, McDouble, Quarter Pounder with Cheese, double Quarter Pounder with Cheese and the Big Mac. Nevertheless, the pickles will still be made with an artificial preservative, although customers can choose to opt out of getting pickles with their burgers. Restaurants in several countries, particularly in Asia, serve soup. This local deviation from the standard menu is a characteristic for which the chain is particularly known, and one which is employed either to abide by regional food taboos (such as the religious prohibition of beef consumption in India) or to make available foods with which the regional market is more familiar (such as the sale of McRice in Indonesia, or Ebi (prawn) Burger in Singapore and Japan). In Germany and some other Western European countries, McDonald's sells beer. In New Zealand, McDonald's sells meat pies, after the local affiliate partially relaunched the Georgie Pie fast food chain it bought out in 1996. In the United States and Canada, after limited trials on a regional basis, McDonald's began offering in 2015 and 2017, respectively, a partial breakfast menu during all hours its restaurants are open. Most standalone McDonald's restaurants offer both counter service and drive-through service, with indoor and sometimes outdoor seating. 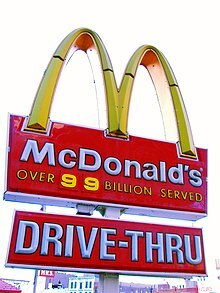 Drive-Thru, Auto-Mac, Pay and Drive, or "McDrive" as it is known in many countries, often has separate stations for placing, paying for, and picking up orders, though the latter two steps are frequently combined; it was first introduced in Sierra Vista, Arizona in 1975, following the lead of other fast-food chains. The first such restaurant in Britain opened at Fallowfield, Manchester in 1986. In some countries, "McDrive" locations near highways offer no counter service or seating. In contrast, locations in high-density city neighborhoods often omit drive-through service. There are also a few locations, located mostly in downtown districts, that offer a "Walk-Thru" service in place of Drive-Thru. McCafé is a café-style accompaniment to McDonald's restaurants and is a concept created by McDonald's Australia (also known, and marketed, as "Macca's" in Australia), starting with Melbourne in 1993. As of 2016, most McDonald's in Australia have McCafés located within the existing McDonald's restaurant. In Tasmania, there are McCafés in every restaurant, with the rest of the states quickly following suit. After upgrading to the new McCafé look and feel, some Australian restaurants have noticed up to a 60 percent increase in sales. At the end of 2003, there were over 600 McCafés worldwide. From 2015–2016, McDonald's tried a new gourmet burger service and restaurant concept based on other gourmet restaurants such as Shake Shack and Grill'd. It was rolled out for the first time in Australia during the early months of 2015 and expanded to China, Hong Kong, Singapore, Arabia and New Zealand, with ongoing trials in the US market. In dedicated "Create Your Taste" (CYT) kiosks, customers could choose all ingredients including type of bun and meat along with optional extras. In late 2015 the Australian CYT service introduced CYT salads. After a person had ordered, McDonald's advised that wait times were between 10–15 minutes. When the food was ready, trained crew ('hosts') brought the food to the customer's table. Instead of McDonald's usual cardboard and plastic packaging, CYT food was presented on wooden boards, fries in wire baskets and salads in china bowls with metal cutlery. A higher price applied. In November 2016, Create Your Taste was replaced by a "Signature Crafted Recipes" program designed to be more efficient and less expensive. Some locations are connected to gas stations/convenience stores, while others called McExpress have limited seating and/or menu or may be located in a shopping mall. Other McDonald's are located in Walmart stores. McStop is a location targeted at truckers and travelers which may have services found at truck stops. In Sweden, customers who order a happy meal can use the meal's container for a pair of happy goggles. The company created a game for the goggles known as "Slope Stars. " McDonald's predicts happy goggles will continue in other countries. In the Netherlands, McDonald's has introduced McTrax that doubles as a recording studio; it reacts to touch. They can create their own beats with a synth and tweak sounds with special effects. The first kosher McDonald's was established in 1997 at the Abasto de Buenos Aires mall in Buenos Aires, Argentina. There are also many kosher branches in Israel. McDonald's playgrounds are called McDonald's PlayPlace. Some McDonald's in suburban areas and certain cities feature large indoor or outdoor playgrounds. The first PlayPlace with the familiar crawl-tube design with ball pits and slides was introduced in 1987 in the US, with many more being constructed soon after. McDonald's Next use open-concept design and offer "Create Your Taste" digital ordering. The concept store also offers free mobile device charging and table service after 6:00 pm. The first store opened in Hong Kong in December 2015. In 2006, McDonald's introduced its "Forever Young" brand by redesigning all of its restaurants, the first major redesign since the 1970s. The goal of the redesign is to be more like a coffee shop, similar to Starbucks. The design includes wooden tables, faux-leather chairs, and muted colors; the red was muted to terracotta, the yellow was shifted to golden for a more "sunny" look, and olive and sage green were also added. To create a warmer look, the restaurants have less plastic and more brick and wood, with modern hanging lights to produce a softer glow. Many restaurants now feature free Wi-Fi and flat-screen TVs. Other upgrades include double drive-thrus, flat roofs instead of the angled red roofs, and replacing fiber glass with wood. Also, instead of the familiar golden arches, the restaurants now feature "semi-swooshes" (half of a golden arch), similar to the Nike swoosh. McDonald's began banning smoking in 1994 when it restricted customers from smoking within its 1,400 wholly owned restaurants. 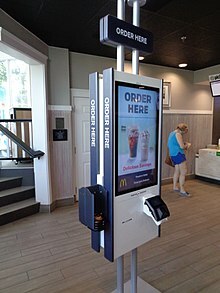 Since the late 1990s, McDonald's has attempted to replace employees with electronic kiosks which would perform actions such as taking orders and accepting money. In 1999, McDonald's first tested "E-Clerks" in suburban Chicago, Illinois, and Wyoming, Michigan, with the devices being able to "save money on live staffers" and attracting larger purchase amounts than average employees. In 2013, the University of Oxford estimated that in the succeeding decades, there was a 92% probability of food preparation and serving to become automated in fast food establishments. By 2016, McDonald's "Create Your Taste" electronic kiosks were seen in some restaurants internationally where customers could custom order meals. As employees pushed for higher wages in the late-2010s, some believed that fast food companies such as McDonald's would use the devices to cut costs for employing individuals. On August 5, 2013, The Guardian revealed that 90 percent of McDonald's UK workforce are on zero hour contracts, making it possibly the largest such private sector employer in the country. A study released by Fast Food Forward conducted by Anzalone Liszt Grove Research showed that approximately 84 percent of all fast food employees working in New York City in April 2013 had been paid less than their legal wages by their employers. From 2007 to 2011, fast food workers in the US drew an average of $7 billion of public assistance annually resulting from receiving low wages. The McResource website advised employees to break their food into smaller pieces to feel fuller, seek refunds for unopened holiday purchases, sell possessions online for quick cash, and to "quit complaining" as "stress hormone levels rise by 15 percent after ten minutes of complaining." In December 2013, McDonald's shut down the McResource website amidst negative publicity and criticism. McDonald's plans to continue an internal telephone help line through which its employees can obtain advice on work and life problems. Liberal think tank, the Roosevelt Institute, accuses some McDonald's restaurants of actually paying less than the minimum wage to entry positions due to 'rampant' wage theft. In South Korea, McDonald's pays part-time employees $5.50 an hour and is accused of paying less with arbitrary schedules adjustments and pay delays. In late 2015, Anonymous aggregated data collected by Glassdoor suggests that McDonald's in the United States pays entry-level employees between $7.25 an hour and $11 an hour, with an average of $8.69 an hour. Shift managers get paid an average of $10.34 an hour. Assistant managers get paid an average of $11.57 an hour. McDonald's CEO, Steve Easterbrook, currently earns an annual salary of $1,100,000. His total compensation for 2017 was $21,761,052. McDonald's workers have on occasions decided to strike over pay, with most of the employees on strike seeking to be paid $15.00. When interviewed about the strikes occurring, former McDonald's CEO Ed Rensi stated: "It's cheaper to buy a $35,000 robotic arm than it is to hire an employee who's inefficient making $15 an hour bagging french fries" with Rensi explaining that increasing employee wages could possibly take away from entry-level jobs. However, according to Easterbrook, increasing wages and benefits for workers saw a 6% increase in customer satisfaction when comparing 2015's first quarter data to the first quarter of 2016, with greater returns seen as a result. In September 2017, two British McDonald's stores agreed to a strike over zero-hours contracts for staff. Picket lines were formed around the two stores in Crayford and Cambridge. The strike was supported by the Leader of the Opposition, Jeremy Corbyn. In March 2015, McDonald's workers in 19 US cities filed 28 health and safety complaints with the U.S. Occupational Safety and Health Administration which allege that low staffing, lack of protective gear, poor training and pressure to work fast has resulted in injuries. The complaints also allege that, because of a lack of first aid supplies, workers were told by management to treat burn injuries with condiments such as mayonnaise and mustard. The Fight for $15 labor organization aided the workers in filing the complaints. In 2015, McDonald's pledged to stop using eggs from battery cage facilities by 2025. Since McDonald's purchases over 2 billion eggs per year or 4 percent of eggs produced in the United States, the switch is expected to have a major impact on the egg industry and is part of a general trend toward cage-free eggs driven by consumer concern over the harsh living conditions of hens. The aviary systems from which the new eggs will be sourced are troubled by much higher mortality rates, as well as introducing environmental and worker safety problems. The high hen mortality rate, which is more than double that of battery cage systems, will require new research to mitigate. The facilities also have higher ammonia levels due to faeces being kicked up into the air. Producers raised concerns about the production cost, which is expected to increase by 36 percent. McDonald's continues to source pork from facilities that use gestation crates, and in 2012 pledged to phase them out. McDonald's has for decades maintained an extensive advertising campaign. In addition to the usual media (television, radio, and newspaper), the company makes significant use of billboards and signage, and also sponsors sporting events ranging from Little League to the FIFA World Cup and Olympic Games. Television has played a central role in the company's advertising strategy. To date, McDonald's has used 23 different slogans in United States advertising, as well as a few other slogans for select countries and regions. McDonald's and NASA explored an advertising agreement for a planned mission to the asteroid 449 Hamburga; however, the spacecraft was eventually cancelled. McDonald's is the title sponsor of the McDonald's All-American Game, all-star basketball games played each year for American and Canadian boys' and girls' high school basketball graduates. McHappy Day is an annual event at McDonald's, during which a percentage of the day's sales go to charity. It is the signature fundraising event for Ronald McDonald House Charities. 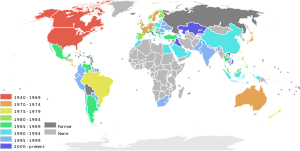 In 2007, it was celebrated in 17 countries: Argentina, Australia, Austria, Brazil, Canada, England, Finland, France, Guatemala, Hungary, Ireland, New Zealand, Norway, Sweden, Switzerland, the United States, and Uruguay. According to the Australian McHappy Day website, McHappy Day raised $20.4 million in 2009. The goal for 2010 was $20.8 million. In 1995, St. Jude Children's Research Hospital received an anonymous letter postmarked in Dallas, Texas, containing a $1 million winning McDonald's Monopoly game piece. McDonald's officials came to the hospital, accompanied by a representative from the accounting firm Arthur Andersen, who examined the card under a jeweler's eyepiece, handled it with plastic gloves, and verified it as a winner. Although game rules prohibited the transfer of prizes, McDonald's waived the rule and made the annual $50,000 annuity payments for the full 20-year period through 2014, even after learning that the piece was sent by an individual involved in an embezzlement scheme intended to defraud McDonald's. McRefugees are poor people in Hong Kong, Japan, and China who use McDonald's 24-hour restaurants as a temporary hostel. One in five of Hong Kong's population lives below the poverty line. The rise of McRefugees was first documented by photographer Suraj Katra in 2013. A PETA activist dressed as a chicken confronts the manager of the Times Square McDonald's over the company's animal welfare standards. In 1990, activists from a small group known as London Greenpeace (no connection to the international group Greenpeace) distributed leaflets entitled What's wrong with McDonald's?, criticizing its environmental, health, and labor record. The corporation wrote to the group demanding they desist and apologize, and, when two of the activists refused to back down, sued them for libel in one of the longest cases in British civil law. A documentary film of the McLibel Trial has been shown in several countries. In the late 1980s, Phil Sokolof, a millionaire businessman who had suffered a heart attack at the age of 43, took out full-page newspaper ads in New York, Chicago, and other large cities accusing McDonald's menu of being a threat to American health, and asking them to stop using beef tallow to cook their french fries. Though the company objected, the term "McJob" was added to Merriam-Webster's Collegiate Dictionary in 2003. The term was defined as "a low-paying job that requires little skill and provides little opportunity for advancement". In 2001, Eric Schlosser's book Fast Food Nation included criticism of the business practices of McDonald's. Among the critiques were allegations that McDonald's (along with other companies within the fast food industry) uses its political influence to increase its profits at the expense of people's health and the social conditions of its workers. The book also brought into question McDonald's advertisement techniques in which it targets children. While the book did mention other fast-food chains, it focused primarily on McDonald's. In 2002, vegetarian groups, largely Hindu and Buddhist, successfully sued McDonald's for misrepresenting its French fries as vegetarian, when they contained beef broth. Morgan Spurlock's 2004 documentary film Super Size Me claimed that McDonald's food was contributing to the increase of obesity in society and that the company was failing to provide nutritional information about its food for its customers. Six weeks after the film premiered, McDonald's announced that it was eliminating the super size option, and was creating the adult Happy Meal. In 2006, an unsanctioned McDonald's Video Game by Italian group Molleindustria was released online. It is parody of the business practices of the corporate giant, taking the guise of a tycoon style business simulation game. In the game, the player plays the role of a McDonald's CEO, choosing whether or not to use controversial practices like genetically altered cow feed, plowing over rainforests, and corrupting public officials. McDonald's issued a statement distancing itself from the game. In January 2014, it was reported that McDonald's was accused of having used a series of tax maneuvers to avoid taxes in France. The company confirmed that tax authorities had visited McDonald's French headquarters in Paris but insisted that it had not done anything wrong, saying, "McDonald's firmly denies the accusation made by L'Express according to which McDonald's supposedly hid part of its revenue from taxes in France." In response to public pressure, McDonald's has sought to include more healthy choices in its menu and has introduced a new slogan to its recruitment posters: "Not bad for a McJob". The word McJob, first attested in the mid-1980s and later popularized by Canadian novelist Douglas Coupland in his book Generation X, has become a buzz word for low-paid, unskilled work with few prospects or benefits and little security. McDonald's disputes this definition of McJob. In 2007, the company launched an advertising campaign with the slogan "Would you like a career with that?" on Irish television, asserting that its jobs have good prospects. In an effort to respond to growing consumer awareness of food provenance, the fast-food chain changed its supplier of both coffee beans and milk. UK chief executive Steve Easterbrook said: "British consumers are increasingly interested in the quality, sourcing, and ethics of the food and drink they buy". In a bid to tap into the ethical consumer market, McDonald's switched to using coffee beans taken from stocks that are certified by the Rainforest Alliance, a conservation group. Additionally, in response to pressure, McDonald's UK started using organic milk supplies for its bottled milk and hot drinks, although it still uses conventional milk in its milkshakes, and in all of its dairy products in the United States. According to a report published by Farmers Weekly in 2007, the quantity of milk used by McDonald's could have accounted for as much as 5 percent of the UK's organic milk output. McDonald's announced on May 22, 2008, that, in the United States and Canada, it would switch to using cooking oil that contains no trans fats for its french fries, and canola-based oil with corn and soy oils, for its baked items, pies and cookies, by year's end. With regard to acquiring chickens from suppliers who use CAK/CAS methods of slaughter, McDonald's says that it needs to see more research "to help determine whether any CAS system in current use is optimal from an animal welfare perspective." After McDonald's received criticism for its environmental policies in the 1970s, it began to make substantial progress in reducing its use of materials. For instance, an "average meal" in the 1970s—a Big Mac, fries, and a drink—required 46 grams (1.6 oz) of packaging; today, it requires only 25 grams (0.88 oz), a 46 percent reduction. In addition, McDonald's eliminated the need for intermediate containers for cola by having a delivery system that pumps syrup directly from the delivery truck into storage containers, saving two million pounds (910 tonnes) of packaging annually. Overall, weight reductions in packaging and products, as well as increased usage of bulk packaging, ultimately decreased packaging by twenty-four million pounds (11,000 tonnes) annually. McDonald's effort to reduce solid waste by using less packaging and by promoting the use of recycled-content materials has been recognized by the U.S. Environmental Protection Agency. In 1990, McDonald's worked with the Environmental Defense Fund to stop using "clam shell"-shaped styrofoam food containers to house its food products. Twenty years later, McDonald's announced they would try replacing styrofoam coffee cups with an alternative material. In April 2008, McDonald's announced that 11 of its Sheffield, England restaurants have been engaged in a biomass trial program that cut its waste and carbon footprint by half in the area. In this trial, wastes from the restaurants were collected by Veolia Environmental Services and were used to produce energy at a power plant. McDonald's plans to expand this project, although the lack of biomass power plants in the United States will prevent this plan from becoming a national standard there anytime soon. In addition, in Europe, McDonald's has been recycling vegetable grease by converting it to fuel for its diesel trucks. McDonald's uses a corn-based bioplastic to produce containers for some of its products. The environmental benefits of this technology are controversial, with critics noting that biodegradation is slow, produces greenhouse gases, and that contamination of traditional plastic waste streams with bioplastics can complicate recycling efforts. In an effort to reduce energy usage by 25 percent in its restaurants, McDonald's opened a prototype restaurant in Chicago in 2009 with the intention of using the model in its other restaurants throughout the world. Building on past efforts, specifically a restaurant it opened in Sweden in 2000 that was the first to intentionally incorporate green ideas, McDonald's designed the Chicago site to save energy by incorporating old and new ideas such as managing storm water, using skylights for more natural lighting, and installing some partitions and tabletops made from recycled goods. McDonald's has been involved in a number of lawsuits and other legal cases, most of which involved trademark disputes. The company has threatened many food businesses with legal action unless it drops the Mc or Mac from trading names. In April 2017, Irish fast-food chain Supermac's submitted a request to the European Union Property Office to cancel McDonald's owned trademarks within the European Union, claiming that McDonald's engaged in "trademark bullying; registering brand names... which are simply stored away in a war chest to use against future competitors", after the trademarks had prevented Supermac's from expanding out of Ireland. The EUIPO ruled in Supermac's favour, finding that McDonald's "has not proven genuine use" of many trademarks, cancelling McDonald's owned trademarks such as 'Big Mac' and certain 'Mc' related trademarks within the European Union. Burger King responded by trolling McDonald's by giving their sandwiches names like "Like a Big Mac But Juicier", "Like a Big Mac, But Actually Big" and "Big Mac-ish But Flame-Grilled of Course". On September 8, 2009, McDonald's Malaysian operations lost a lawsuit to prevent another restaurant calling itself McCurry. McDonald's lost in an appeal to Malaysia's highest court, the Federal Court. In April 2007, in Perth, Western Australia, McDonald's pleaded guilty to five charges relating to the employment of children under 15 in one of its outlets and was fined A$8,000. The longest-running legal action of all time in the UK was the McLibel case against two defendants who criticized a number of aspects of the company. The trial lasted 10 years and called 130 witnesses. The European Court of Human Rights deemed that the unequal resources of the litigants breached the defendants rights to freedom of speech and biased the trial. The result was widely seen as a "PR disaster." 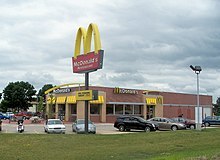 A famous legal case in the US involving McDonald's was the 1994 decision in Liebeck v. McDonald's Restaurants where Albuquerque, New Mexico, resident Stella Liebeck was initially awarded $2.86 million (equivalent to $4.49 million in 2018) after 81 year old Liebeck suffered third-degree burns after spilling a scalding cup of McDonald's coffee on herself. The award was later reduced to $640,000 (equivalent to $1.0 million in 2018). In April 2014, it was reported that McDonald's in Europe will use chicken meat that was produced by using genetically modified animal feed. Greenpeace argues that McDonald's saves less than one Eurocent for each chicken burger and goes down a path not desired by its customers. At the end of 2018, a study was published by London Metropolitan University showing that bacteria were found on McDonald's self-service screens, which normally only occur in intestinal tracts or faeces. A total of eight restaurants were examined in London and Birmingham, and more than 10 potentially harmful germs were found, including an antibiotic-resistant bacteria. ^ Bomkamp, Samantha (June 13, 2016). "Mcdonald's HQ Move Is Boldest Step Yet in Effort to Transform Itself". Chicago Tribune. Retrieved May 1, 2017. ^ "Enrique Hernandez, Jr". McDonalds.com. ^ "McDonald's Corporation 2017 Annual Report Form (10-K)" (PDF). United States Securities and Exchange Commission. February 23, 2018. Retrieved August 21, 2018. ^ a b "McDonald's future Near West Side neighbors air parking, traffic safety beefs". Chicago Tribune. Retrieved August 7, 2016. ^ a b Hufford, Austen (June 14, 2016). "McDonald's to Move Headquarters to Downtown Chicago". Retrieved August 7, 2016 – via The Wall Street Journal. ^ "McDonald's Headquarters Opening in West Loop, Offers Food From Around The World". Retrieved April 25, 2018 – via CBS Chicago. ^ null. "McDonald's Is King Of Resaurants In 2017 – pg.1". Forbes. Retrieved December 12, 2017. ^ "McDonald's: 60 years, billions served". Chicago Tribune. Retrieved July 30, 2017. ^ a b c "Data" (PDF). d18rn0p25nwr6d.cloudfront.net. ^ Robbins, John (October 8, 2010). "How Bad Is McDonald's Food?". HuffPost. ^ "The world's 30 largest employers will surprise you". www.msn.com. 2018-06-29. Retrieved 2019-03-29. ^ "The World's Largest Employers". WorldAtlas. Retrieved 2019-03-29. ^ "The McDonalds and Their Restaurant". referenceforbusiness.com. Retrieved January 16, 2017. In 1962, McDonald's golden arches replaced Speedee as the restaurant's main symbol, and ads told customers to "Look for the golden arches." ... Kroc believed in advertising heavily and in targeting children. In 1965, the company introduced a new mascot, a red-haired clown named Ronald McDonald, who became a frequent and friendly face in television commercials. ^ "McDonalds Museum". Juan Pollo. Archived from the original on March 10, 2012. Retrieved May 14, 2012. ^ "McDonald's Momentum Delivers Another Year of Strong Results for 2011". Yahoo Finance. January 24, 2012. Archived from the original on March 18, 2012. Retrieved January 25, 2012. ^ Brand, Rachel (December 23, 2006). "Chipotle founder had big dreams". Rocky Mountain News. Archived from the original on July 8, 2009. Retrieved April 27, 2012. ^ "McDonald's sets October deadline to sell Chipotle stock". Denver Business Journal. July 25, 2006. Retrieved August 10, 2009. ^ "McDonald's Wraps Up Boston Market Sale". Dow Jones & Company, Inc. News Services. August 27, 2007. Archived from the original on September 28, 2007. Retrieved August 28, 2007. ^ Baertlein, Lisa (September 24, 2009). "McDonald's raises cash dividend by 10%". Reuters. Retrieved August 27, 2010. ^ "Definition of S&P 500 Aristocrat at Investopedia". Investopedia.com. Retrieved August 27, 2010. ^ "List of 2009 Dividend Aristocrats via Seeking Alpha. Retrieved 10/1/2009". Seekingalpha.com. December 23, 2008. Retrieved August 27, 2010. ^ "McDonald's". Fortune. Retrieved November 18, 2018. ^ Tiffany Hsu (November 9, 2012). "McDonald's monthly sales fall for first time in nine years". Los Angeles Times. Retrieved March 9, 2013. ^ "McDonald's New Turnaround Plan Is So 1990s". ^ Baertlein, Lisa (March 14, 2017). "McDonald's, late to mobile ordering, seeks to avoid pitfalls". Reuters. Retrieved March 15, 2017. ^ Patton, Leslie (November 23, 2015). "McDonald's Knows You're Sick of Screw-Ups at Drive-Thru Windows". Bloomberg. Retrieved March 15, 2017. ^ Ferdman, Roberto A. (August 13, 2015). "This is a terrible sign for McDonald's". The Washington Post. ^ a b "McDonald's to Cut U.S. Stores for First Time in Decades". The New York Times. Associated Press. June 18, 2015. ^ "McDonald's: Entwicklung der Anzahl der Restaurants bis 2017 | Statistik". Statista (in German). Retrieved November 18, 2018. ^ a b c "2007 Annual Report" (PDF). ^ Lublin, Joann S.; Jargon, Julie (October 15, 2015). "McDonald's Nears Decision on Real Estate". Retrieved October 22, 2015. ^ Jargon, Julie. "McDonald's Won't Spin Off Real Estate Holdings". The Wall Street Journal. ISSN 0099-9660. Retrieved November 11, 2015. ^ "Hamburger University Campus". mcdonalds.com. Retrieved January 18, 2017. ^ "Hamburger University – Our Facility". ^ "McDonald's Business Model and Strategy :: McDonald's". corporate.mcdonalds.com. Retrieved January 24, 2017. ^ Eidelson, Josh (November 19, 2013). "McDonald's tells workers to "sing away stress," "chew away cares" and go to church". Salon. Retrieved August 21, 2014. These and other tips appear on a "McResource Line" website created by the McDonald's Corp. to advise workers on stress, health and personal finances. Among the tips that appear on the site: "Chewing gum can reduce cortisol levels by 16%"; "At least two vacations a year can cut heart attack risk by 50%"; "Singing along to your favorite songs can lower your blood pressure"; and "People who attend more church services tend to have lower blood pressure." ^ Schlosser, Eric. Fast Food Nation. ^ Steele, Jeffrey. Oak Brook history in caring hands society president is part of village's changing heritage". Chicago Tribune. July 29, 1998. Page 88. Retrieved September 17, 2009. ^ Cross, Robert. Inside Hamburger Central". Chicago Tribune. January 9, 1972. G18. Retrieved September 17, 2009. ^ "Board of Directors". McDonald's. Retrieved January 16, 2019. ^ "India's 50 most trusted brands". Rediff.com. January 20, 2011. ^ "The Big Mac index". The Economist. October 7, 2015. ^ "The Big Mac index – Currency comparisons, to go". The Economist. July 28, 2011. Retrieved July 28, 2011. ^ Friedman, Thomas L. (December 8, 1996). "Foreign Affairs Big Mac I". The New York Times. ISSN 0362-4331. Retrieved January 24, 2017. ^ "The Lexus and the Olive Tree". Thomaslfriedman.com. Retrieved July 23, 2011. ^ "McDonald's quits Crimea due to fears of trade clash". INA Daily News. Retrieved April 5, 2014. ^ "Russia Shuts 4 McDonald's Restaurants Amid Ukraine Tensions". Moscow News.Net. August 20, 2014. Retrieved August 21, 2014. ^ "Russian Deputy PM says McDonalds is not being targeted in response to sanctions". Russia Herald. August 23, 2014. Retrieved August 23, 2014. ^ "McDonald's deal with oil company marries China's new love of fast food, cars". Archived from the original on March 25, 2007. ^ Samuel, Henry (October 4, 2009). "McDonald's restaurants to open at the Louvre". The Daily Telegraph. London. ^ Gasparro, Annie; Jargon, Julie (September 5, 2012). "McDonald's to Go Vegetarian in India". The Wall Street Journal. p. B7. ^ "10 Countries That Don't Have McDonald's". WhatCulture.com. Retrieved December 1, 2015. ^ "Voluntary Announcement: Acquisition of a Controlling Interest in Mcdonald's Mainland China and Hong Kong Businesses" (PDF). CITIC Limited. Hong Kong Stock Exchange. January 9, 2017. Retrieved January 13, 2017. ^ Luna, Nancy (Apr 1, 2019). "McDonald's buys 10% stake in New Zealand app developer". Nation's Restaurant News. Retrieved April 2, 2019. ^ "Fanatics Preach Fast Food Evangelism". Fox News Channel. July 23, 2011. Archived from the original on March 28, 2012. Retrieved August 3, 2011. ^ "McDonald's is going for healthier fare and greater digitisation". The Economist. January 28, 2017. ISSN 0013-0613. Retrieved February 5, 2017. ^ "McDonald's to remove corn syrup from buns, curbs antibiotics in chicken". Reuters. August 1, 2016. ^ "McDonald's says classic burgers no longer have artificial ingredients". Free Malaysia Today. September 28, 2018. Retrieved October 1, 2018. ^ "McDonald's Removing Artificial Preservatives From 7 Classic Burgers". Retrieved October 1, 2018. ^ "McDonald's says classic burgers no longer have artificial ingredients". AFP.com. Retrieved October 1, 2018. ^ "McDonald's makes move to ditch artificial preservatives, colours and flavours". NewsComAu. Retrieved October 1, 2018. ^ "McDonald's takes Georgie Pie nationwide". Stuff.co.nz. October 1, 2013. Retrieved April 13, 2018. ^ "The Time is Now: McDonald's Serving All Day Breakfast Nationwide". McDonald's. Retrieved February 28, 2018. ^ "McDonald's all-day breakfast launches across Canada". Global News. Retrieved February 28, 2018. ^ a b c Mohapatra, Sanjay (2012). Information Strategy Design and Practices. Google Books: Springer Science & Business Media. p. 301. ISBN 1-4614-2427-5. ^ Craven, Scott (August 29, 2016). "AZ Central — You won't believe where McDonald's opened its first drive-thru" (News Article). ^ "McDonald's Restaurants". Caterersearch.com. Archived from the original on July 16, 2011. Retrieved July 23, 2011. ^ "McDrive: il fast food comodo, facile e veloce". McDonald's Italia. Retrieved June 6, 2016. ^ "McDonald's vs Newk's Franchise Cost Comparison and Analysis". thefranchisemall.com. Retrieved June 6, 2016. ^ Duca, Lauren. "This McDonald's has a "Walk-Thru"". Teen Vogue. Retrieved June 6, 2016. ^ "McDonald's Australia". mcdonalds.com.au. Retrieved June 6, 2016. ^ Kieler, Ashlee. "McDonald's Ends 'Create Your Taste' Customized Burger Program". Consumerist. Retrieved December 18, 2016. ^ "McDonald's and BP test combined operations. (McDonald's Restaurants; BP Oil Co.)". Archived from the original on January 18, 2012. ^ "McDonald's serves up 'MCSTOP' – Its restaurant for big crowds". August 16, 1984. ^ a b c d e "Restaurants going high tech". Yahoo Tech. June 14, 2016. Retrieved June 14, 2016. ^ "Buenos Aires Restaurants – Kosher McDonald's". The New York Times. Archived from the original on March 3, 2009. Retrieved July 23, 2011. ^ "Big Mac with a side of quinoa? Inside the world's first McDonald's Next". CNN. Retrieved August 9, 2016. ^ "McDonald's wants a digital-age makeover". Archived from the original on September 23, 2006. ^ "Mickey D's McMakeover". Archived from the original on May 24, 2006. ^ Bruce Horovitz (May 9, 2011). "McDonald's revamps store to look more upscale". USA Today. Retrieved June 26, 2012. ^ "McDonald's Bans Smoking at All the Sites It Owns". The New York Times. February 24, 1994. ^ Gibson, Richard (August 12, 1999). "Want Fries With That? Ask McDonald's New E-Clerks". The Wall Street Journal. ^ O'Toole, James (May 22, 2014). "Robots will replace fast-food workers". CNN. Retrieved August 18, 2016. ^ Johnson, Hollis (May 16, 2016). "Fast food workers are becoming obsolete". Business Insider. Retrieved August 18, 2016. ^ Neville, Simon (August 25, 2008). "McDonald's ties nine out of 10 workers to zero-hours contracts". The Guardian. London. Retrieved August 10, 2013. ^ Maclay, Kathleen. "Fast Food, Poverty Wages: The Public Cost of Low-wage jobs in the Fast Food Industry". University of California Labor Center October 15, 2013. ^ Susanna Kim (November 21, 2013). McDonald's Defends Telling Workers to 'Quit Complaining' to Reduce Stress. ABC News. Retrieved November 21, 2013. ^ Associated Press (December 26, 2013). "McDonald's Closes Employee Website Amid Criticism". DailyDigest. Archived from the original on December 28, 2013. Retrieved December 26, 2013. ^ Goldberg, Harmony, "How McDonald's gets away with rampant wage theft", Salon, April 6, 2015. Retrieved May 22, 2015. ^ Tae-hoon, Lee (August 16, 2015). "McDonald's lures customers with illegal ads on Independence Day". The Korea Observer. Retrieved August 17, 2015. ^ "McDonald's Hourly Pay". Glassdoor. Retrieved December 1, 2015. ^ Beckerman, Josh. "McDonald's New CEO Gets 69% Pay Raise", Wall Street Journal, March 3, 2015. Retrieved May 22, 2015. ^ Sherman, Erik (July 12, 2018). "How Many Workers Must Live In Poverty For McDonald's CEO To Make $21.8 Million?". Forbes. Retrieved July 18, 2018. ^ Bruce Horovitz and Yamiche Alcindor (April 15, 2015). Fast-food strikes widen into social-justice movement. USA Today. Retrieved May 22, 2015. ^ a b Taylor, Kate (May 25, 2016). "McDonald's ex-CEO just revealed a terrifying reality for fast-food workers". Business Insider. Retrieved August 18, 2016. ^ "McDonald's faces strike for first time in UK as workers take action over pay and zero-hour contracts". The Independent. September 4, 2017. Retrieved September 4, 2017. ^ "McDonald's workers to go on strike in Britain for first time". The Guardian. September 4, 2017. Retrieved September 4, 2017. ^ "Fast-food chains tell workers to treat burns with mustard, ketchup, and mayo". Mother Jones. Retrieved November 14, 2017. ^ Jana Kasperkevic (March 16, 2015). McDonald's workers told to treat burns with condiments, survey shows. The Guardian. Retrieved March 17, 2015. ^ Owen, Tess (September 10, 2015). "McDonald's Is Switching to Cage-Free Eggs at a Delicate Moment for the Poultry Industry". VICE News. Retrieved August 4, 2016. ^ "The Insanely Complicated Logistics of Cage-Free Eggs for All". Wired. Retrieved August 4, 2016. ^ Gelles, David (July 16, 2016). "Eggs That Clear the Cages, but Maybe Not the Conscience". The New York Times. Retrieved August 4, 2016. ^ Kesmodel, David (March 18, 2015). "Cage-Free Hens Study Finds Little Difference in Egg Quality". The Wall Street Journal. Retrieved August 4, 2016. ^ Strom, Stephanie (February 13, 2012). "McDonald's Set to Phase Out Suppliers' Use of Sow Crates". The New York Times. Retrieved August 4, 2016. ^ Smith, Andrew F. (2012). Fast Food and Junk Food: An Encyclopedia of What We Love to Eat, Volume 1. ABC-CLIO. p. 175. ^ "McDonald's slogans used around the world, past and present". Retrieved June 23, 2015. ^ "Mars rover Curiosity's other mission: publicity machine". Statesman.com. December 5, 2012. Archived from the original on January 15, 2013. Retrieved March 9, 2013. ^ McHappy Day, Ronald McDonald House Charities. Retrieved September 12, 2010. ^ McHappy Day Archived April 25, 2013, at the Wayback Machine. Retrieved November 8, 2010. ^ "Donor Turns Fast Food Into Big Bucks For Hospital". The New York Times. December 8, 1995. Retrieved May 24, 2010. ^ "The night time 'McRefugees' of Hong Kong". BBC News. October 27, 2015. Retrieved October 10, 2016. ^ "McLibel: Longest case in English history". BBC News. Retrieved April 9, 2015. ^ Dennis McLellan (April 16, 2004). "Phil Sokolof, 82; Used His Personal Fortune in Fight Against High-Fat Foods". Los Angeles Times. Retrieved August 11, 2017. ^ a b "Merriam-Webster: 'McJob' is here to stay". CNN Offbeat News. Associated Press. November 11, 2003. Archived from the original on April 12, 2008. ^ "McJob". Merriam-Webster's Online Dictionary. 1986. Retrieved November 29, 2009. ^ "Letter from McDonald's headquarters claiming fries are vegetarian". ^ Bluestien, Greg. "Creators Put Politics Into Video Games", The Associated Press, published January 21, 2007. Retrieved April 20, 2007. ^ "Do You Want Fries With That Audit?". Forbes. January 23, 2014. ^ Sweney, Mark (April 20, 2006). "Not bad for a McJob?". The Guardian. London. Retrieved March 30, 2009. ^ Ian Ashbridge (July 3, 2007). "McDonalds' milk goes organic – 7/3/2007 – Farmers Weekly". Fwi.co.uk. Archived from the original on May 14, 2012. Retrieved June 7, 2012. ^ Carrigan, Marylyn and De Pelsmacker, Patrick (2009). Will ethical consumers sustain their values in the global credit crunch? International Marketing Review, 26(6), pp. 674–687,(p.7). ^ "The Truth-O-Meter : Chef Jamie Oliver praises McDonald's in England". Truth-O-Meter. Retrieved October 22, 2012. ^ Ian Ashbridge (July 3, 2007). "McDonald's milk goes organic – 03/07/2007 – FarmersWeekly". Fwi.co.uk. Archived from the original on September 24, 2009. Retrieved August 27, 2010. ^ "McDonald's Holds down Dollar Meal, Making Menu Healthier". International Business Times. May 22, 2008. Retrieved July 23, 2011. ^ "McDonald's says all US French fries cooked in zero-trans-fat oil". gmanews. Archived from the original on January 14, 2011. ^ "Report of the Corporate Responsibility Committee of the Board of Directors of McDonald's Corporation" (PDF). November 19, 2009. Archived from the original (PDF) on July 17, 2011. Retrieved July 23, 2011. ^ "National Pollution Prevention Center for Higher Education" (PDF). ^ Environmental Defense Fund. Task Force Report. p. 42. ^ Environmental Defense Fund and McDonald's Corporation. Waste Reduction Task Force Final Report. Oak Brook, IL: McDonald's, 1991. p. 22. ^ "Corporation. McDonald's Packaging – The Facts. Oak Brook, IL: McDonald's, 1990. p. 7". ^ "U.S. Environmental Protection Agency". Archived from the original on August 5, 2012. Retrieved April 17, 2008. ^ "McDonald's and Environmental Defense Fund Mark 20 Years of Partnerships for Sustainability". Environmental Defense Fund. November 15, 2010. Retrieved November 28, 2013. ^ "McDonald's testing eco-friendlier coffee cups". NBC News. March 12, 2012. Retrieved November 28, 2013. ^ "McDonald's hails success of waste-to-energy trial". Businessgreen.com. April 14, 2008. Archived from the original on September 26, 2012. Retrieved April 9, 2015. ^ "Local woman creates environmental-friendly Web site". Herald-dispatch.com. April 19, 2008. Archived from the original on September 5, 2012. Retrieved July 23, 2011. ^ Vidal, John (April 26, 2008). "'Sustainable' bio-plastic can damage the environment". The Guardian. London. Retrieved July 23, 2011. ^ Goodman, Matthew (April 5, 2009). "Big Mac, hold the CO2". The Sunday Times. London. ^ "'It's like Connacht winning against the All Blacks': Supermac's CEO responds to Big Mac trademark success against McDonald's". Independent.ie. Retrieved 2019-01-18. ^ "'End of the McBully' - Supermac's wins McDonald's case". 2019-01-15. ^ "EU strips McDonaldâ€™s of its Big Mac trademark in Europe". The Independent. 2019-01-15. Retrieved 2019-01-18. ^ "'Like a Big Mac But Juicier': Burger King renames sandwiches to troll McDonald's". The Guardian. ^ "McDonald's fined for employing underage workers". ABC News. April 12, 2007. Archived from the original on April 18, 2007. Retrieved April 12, 2007. ^ "McLibel: Longest case in English history". BBC News. February 15, 2005. Retrieved January 17, 2016. ^ Weiman, Darryl S. (July 1, 2018). "The McDonalds' Coffee Case". Huffington Post. Retrieved August 25, 2018. ^ Do You Know the Full Story Behind the Infamous McDonald's Coffee Case and How Corporations Used it to Promote Tort Reform? Democracy Now! January 25, 2011. ^ "McDonald's: Gentechnik im Burger". Der Spiegel (in German). April 27, 2014. Retrieved December 1, 2015. ^ "Poo found on every McDonald's touchscreen tested". Metro. November 28, 2018. Retrieved April 17, 2019. Evans, Stephen (April 20, 2004). "McDonald's: The journey to health". BBC News. Retrieved June 30, 2016. Horovitz, Bruce (May 8, 2014). "McDonald's testing seasoned fries". USA Today. Retrieved June 30, 2016. Love, John F. (April 1987). "Big Macs, Fries, and Real Estate". Financial Executive (4): 20–6. Thomas Derdak and Jay P. Pederson, ed. (2004). "McDonald's". International directory of company histories. 67 (3rd ed.). St. James Press. pp. 108–9. ISBN 978-1-55862-512-9.